The Department of Hawaiian Homelands (DHHL) owns land across the Hawaiian islands that it leases out on 99-year leases to residents of Hawaiian ancestry. All told, DHHL helps provide solutions to Hawaii’s housing challenges with roughly 10,000 leaseholders living on DHHL land. The entity and leaseholder program provide much needed relief from high cost of living for many Hawaiian people. Residents, many of whom own their own homes on the leased land, pay their own utility bills. With Hawaii’s sky high rates for electricity, needless utility spending puts a major crimp in many peoples’ finances. 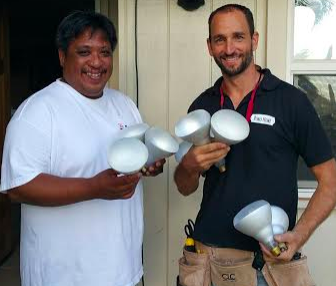 That’s me (right) with a happy customer after switching his home to LEDs. DHHL homes are a high priority item for Hawaii Energy, the ratepayer funded energy conservation program serving the Hawaiian Electric Industries territories (Hawaii island, Maui, Lanai, Molokai, and Oahu), as it seeks to help Hawaii move toward 100% clean energy by 2045. Hawaii Energy has partnered with our company, Pono Home, a Honolulu-based home efficiency company, to provide retrofits to DHHL residents free of charge. The program is funded through the state’s barrel tax, which levies a small fee on each barrel of oil that gets imported to the Hawaiian islands. The program covers free high efficiency fixture retrofits (e.g., LED lighting), and will deliver energy educational materials to people who may not have been exposed to that sort of material in the past. Education materials will include very practical yet very useful things like effective tips to hang clothes to dry, how to stay cool using energy efficient Air Conditioning alternatives, and more, and have been translated into multiple languages. The program kicked off earlier this month, and so far, DHHL residents participating in the program have received an average of about $400 worth of upgrades to their homes, with payback periods that should be achieved within one year, and life expectancies on all installed products to extend for many years to come, yielding significant lifetime energy savings.